Catherine Aird’s new book has arrived. Losing Ground is the latest in the long series featuring DI Sloan and DC Crosby of the Calleshire Constabulary. The novels are characterised by light humour and a smoothly readable style. I’m lucky to have a first edition of Seedy Sloan’s debut, The Religious Body, which dates back to 1966. It contains an excellent map of the fictional county in which Aird sets her books. At one time, maps often featured in whodunits. Like family trees, and lists of characters, maps have rather gone out of fashion in recent years, but for the whodunit fan, they are often both useful and (if well done) entertaining in themselves. Unable to resist temptation, I included a family tree in The Arsenic Labyrinth, while there was a map of fictitious Brackdale in the US edition of The Coffin Trail. But I digress. It’s a pleasure to anticipate a new Catherine Aird novel. Her short stories are equally effective, and I was grateful to have the opportunity to include one of them, ‘Chapter and Hearse’, in the 1998 CWA anthology Past Crimes. The tale also provided the title for a recent collection of Catherine’s work in the short form, a book which contains several gems. Catherine was a UK editor of The Oxford Companion to Crime & Mystery Writing, an under-rated reference work, and is an expert on the life and work of the late Josephine Tey, one of the greatest names from the Golden Age. Her knowledge of the tricks of the crime writer’s trade ensures that plotting is one of her strengths. I have a bad habit of starting to read a new book at a time when I have several other, perfectly enjoyable, books as yet unfinished. But often temptation is too great to resist. So it is with the latest by Kate Charles, Secret Sins. It’s been a while since I’ve read one of Kate’s novels, although I much enjoyed a short story she wrote a while back. It was set in Liverpool and quite excellent, with an original Beatles-related angle. I was sorry when, for reasons outside my control, it didn’t finish up in the anthology I was editing at the time. It must be getting on for fifteen years since I first came across Kate’s work, through a book called A Drink of Deadly Wine. I’ve long been struck by her ability to capture the essence of English society – this is all the more impressive a gift, given that she is American by birth, although these days she resides in Ludlow. The new book begins with an encounter at a Mothers’ Union meeting, and the central character, Callie Anson, is a curate, ‘nearly a priest’. So far, it’s an entertaining read, offering a welcome break from endless gruesome descriptions of forensic pathology. A reminder, if one were needed, that one of the strengths of the crime genre is its sheer range. Kate Charles’ books might be described by some as ‘cosy’, but she does not flinch from examining the dark side of human behaviour. If you haven’t encountered her work, it certainly deserves a look. I’m combining a couple of things at present. First, working on the final edit of Waterloo Sunset. Second, mulling over ideas for the fourth Lake District Mystery. This weekend I spent a little time up in the Lakes with the family, wandering in the area around Windermere, Ambleside and Grasmere, where the next book is likely to be set. Saturday was grey and wet, but still the roads were packed with traffic and almost all the hotels had ‘no vacancies’ signs. We had an evening meal in a crowded pub, full of people cheering the rugby on television. Maybe this will give me an atmospheric future scene, but more important was a possible idea for the main plot, which came from a chance remark made by my wife Helena - as we queued in traffic on the M6. Hunting round for background colour, I picked up a magazine called ‘Lake District Life’ and was startled – and, of course, gratified - to find an article about crime fiction in the Lakes which gave generous coverage to my books as well as the recent stand-alones by Reg Hill and Val McDermid. So quite a productive trip, despite the weather. The article also mentioned a novel I’m not familiar with by Gillian Linscott. I vividly remember appearing in the theatre at Nottingham with Gillian and Stephen Murray in the mid 90s. We performed a show that she and Stephen had written about the history of crime fiction. As our car ground to a standstill at roadworks on the way home, I reflected that Stephen is another of those crime novelists who seems to have disappeared from the scene in recent years. A shame, because his books, which featured in the late lamented Collins Crime Club, were polished and highly readable. Earlier this year, along with a number of other British crime writers, I was invited to be interviewed on Legal TV as part of a series they were making about the contemporary mystery fiction. I drove down to the studios in Birmingham and was duly interrogated (very gently) by Raychel Harvey Jones – the result is to be found on my website. But the real highlight of the trip was quite unexpected. Whilst I was waiting to go on, I started talking to another crime writer who was there for the same purpose, someone I hadn’t met before. This turned out to be Pauline Rowson, who had travelled up from Hampshire with her husband and, although I wasn’t familiar with her work at that point, I enjoyed our conversation. Pauline was interviewed immediately before me and I was struck by her very polished performance. It therefore came as no surprise when I learned that her previous books include one called Building a Positive Media Profile. Pauline is now focusing on crime fiction and doing so with such impressive professionalism that I’m sure it’s only a matter of time before her books become widely known. They are ‘marine mysteries’ and I’ve just laid my hands on the most recent paperback, In for the Kill. It’s a lively first person revenge thriller, which derives strength from Pauline’s obvious love and knowledge of boats and the sea. Pauline’s blog – see the links – is well worth keeping an eye on. In fact, she is one of those whose example inspired me to have a crack at blogging myself. 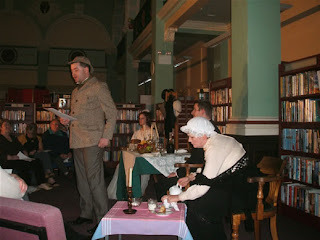 Last night I presented a Victorian Murder Mystery evening as part of the centenary celebrations of Eccles Library. The library was the gift of Andrew Carnegie and it is an impressive place; pictures of famous writers of the past gazed down on me and the members of the Barton Theatre Company, who formed the cast of suspects. The quest to solve the puzzle of who did bump off George Hargrave has attracted a lot of interest ever since the first performance back in 2004. Last night the library was filled to capacity and that isn’t unusual. I guess that people enjoy the interactive element, and the chance to win prizes, and so more tend to come along than might attend a conventional talk. It’s a good way to reach out to a fresh group of prospective readers. It’s always fun to read the solutions to the mystery put forward by members of the audience – some of the explanations are brilliantly ingenious, even if wide of the mark. The best detective in Eccles proved to be a suitably delighted Irene Smith. One more Victorian event is planned before the end of the year – at the Dudson Museum in the Potteries, a setting that sounds to be full of character. A number of venues have asked me to come up with another murder mystery event along similar lines so that they can run a repeat performance. And on the way home from Eccles, I had the glimmering of an idea…. I gave a talk at a Rotary Club event near Manchester last night and during the question session someone asked about the role of agents and editors, and in particular whether they influence the way in which I write my books. My take on this is that the book is ultimately the writer’s personal responsibility, but it is always valuable to listen carefully to constructive comments (including criticisms and suggestions for change) from sensible people whose sole concern, like mine, is to make the book as enjoyable as can be. I’ve been lucky to have a terrific agent, Mandy Little, throughout my career, and I’ve also been fortunate with my editors in the past, as well as nowadays. Both Susie Dunlop in the UK and Barbara Peters in the US don’t hold back if they think there is something in the manuscript that needs changing, and that’s a good thing. This isn’t to say that a writer should slavishly follow every piece of advice – in any case, sometimes advice given by a number of people can be contradictory, because so much depends on subjective judgments. But there’s no point in any writer becoming a prima donna. We can all think of famous and gifted novelists whose later work was not quite up to standard. One reason for this may have been because either their editors feared displeasing them, or because the writer became reluctant to accept criticism. At the moment I’m working on a few final adjustments to Waterloo Sunset in the light of Susie’s comments. All being well, the fine-tuning will be finished by this time next week. Nominations come in from CWA members. Not every name suggested meets the stringent requirements for the award, to put it mildly (the only secret I will reveal is that to my utter astonishment, a kind though over-generous person once nominated me…). But a look at the list of Diamond Dagger winners suggests that in the end, quality counts. The most recent winner was John Harvey, whose books I have enjoyed since Lonely Hearts, the very first one, appeared around the time I first began to review crime novels. This is one of the great pleasures of reviewing – occasionally you come across a writer you might not otherwise have encountered, whose style and panache takes your breath away. I have a prejudice in favour of crime novels where the culprit’s motivation is intriguing. Thinking about the motive for murder is my usual starting point when getting down to write a new book. The motive in The Arsenic Labyrinth is one of my favourites. It was an elaboration of an idea that fascinated me and which I once tried out in an otherwise very different short story. I’m always on the look-out for interesting motives in books by other writers. One of the most ingenious from the Golden Age is to be found in Death Walks in Eastrepps, by the now little-known Francis Beeding. He wrote the novel on which Hitchcock based, very loosely, that great movie Spellbound. Among recent books I’ve read, the most memorable in terms of murderous motive must be Peter Lovesey’s The Secret Hangman. Lovesey is such a smooth writer that it’s easy to forget how accomplished he is. The latest entry in the Peter Diamond series is one of his best. How useful are books like this? Opinions vary, and in the past I’ve come across a few dodgy bits of teach-yourself ‘wisdom’, but you can always make your own mind up whether or not to agree. Even if you only pick half a dozen thought-provoking ideas out of a book, it surely justifies a couple of hours’ reading. I’m biased, of course, but I do think Janet’s book deserves a look if you want to make it as a crime writer. My only regret about this book is that working on it may have distracted Janet from her own crime fiction. It’s too long since her last Darina Lisle novel appeared. The good news is that she mentions a current work-in-progress that ‘may or may not turn out to be the first of a series.’ Something to look forward to. The Crippen case has fascinated me for a long time. Nic Gabriel, the hero of my novel of psychological suspense, Take My Breath Away, wrote a best-selling book about the case. When I created Nic, I researched Crippen’s life and it fired my enthusiasm, prompting me to work on a story told from his perspective. Not that I’m alone among crime writers in having been intrigued – Agatha Christie and Raymond Chandler were equally interested in the mystery of 39 Hilldrop Crescent, while among the many novels influenced by the case, probably the best is Peter Lovesey’s The False Inspector Dew. Now there are claims that Crippen was innocent because the DNA of the human remains found buried in the cellar of his home does not match that of descendants of his wife Cora (aka music hall artiste Belle Elmore.) So to whom did the remains belong? A victim of a botched abortion carried out by Crippen, say some. The new theory has plenty of appeal, and the people who have carried out such extensive detective work deserve congratulations on their diligence. However, although I can believe that Crippen carried out abortions, there seems to be no firm evidence to support this aspect of the theory. Can it really be that Cora Crippen ran off, as Crippen claimed, disappearing so effectively as never to be heard of again? She was such an extrovert that it seems wholly out of character. Why did she leave immediately after a night entertaining friends, and why did she not take her money and belongings? Why was no trace of her ever found, despite an international search? It isn’t easy to credit that she allowed her husband to be executed without stepping forward to exonerate him. Even if she did, how was it that she cut herself off from all her family and connections – not least the friends who did so much to persuade Scotland Yard to investigate her disappearance, because they regarded it as incredible? So I’m yet to be convinced. Are we placing too much faith on DNA techonology here? One of the joys of writing a crime series is that you can plant ‘clues’ in a novel that foreshadow developments not only in that book, but also in later stories. For instance, in the Harry Devlin series, I once introduced a shadowy character known as ‘the Scissorman’, whose identity was only revealed in the next book. In The Coffin Trail, there is mention of Daniel Kind’s mysterious garden at Tarn Cottage, the secret of which is only uncovered in The Cipher Garden. The snag is that readers often don’t read series books in chronological order, so I work hard to make sure that this kind of trickery doesn’t spoil enjoyment. The key is to avoid revelations that undermine an earlier book. Right at the end of The Arsenic Labyrinth, Daniel indicates that his next research project will be Thomas de Quincey. I planted that seed a couple of years ago, without knowing how, or if, de Quincey would play a part in the next Lake District Mystery. I’ve decided that he should. But I’m still hazy about the story-line. At present, I’m reading quite a lot of material by and about de Quincey, one of those literary legends I’ve never paid much attention to in the past. An interesting writer and man. So far as I know, he’s never featured significantly, even in an indirect way, in a crime novel. Yet as the recent introduction to the OUP edition of On Murder says, in some respects he paved the way for the modern fascination with crime. Plenty to work on, then…. When my first book appeared in paperback, I had lunch with the sales rep from Bantam. A good salesman, working for a good publisher. 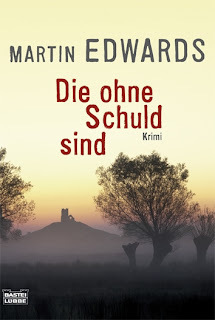 He shocked the (relatively) young and innocent Martin Edwards by saying that in his opinion, the cover of a book was more important than the content. His argument was that he only had a few seconds to market each title in his catalogue to booksellers, and their judgments were based on whether or not they liked the covers. So much for the creative artist, then. I still cling to the belief that in the long run, what matters most is what is inside the book. But covers are definitely important. Publishers are usually kind enough to consult me for my views, but it’s not always easy for an author to judge what sort of artwork will attract readers. I mentioned Knutsford the other day and it reminded me that, in the early 90s, I organised a weekend in the town for the Northern Chapter of the Crime Writers Association. Reginald Hill, Peter Walker (creator of the books behind Heartbeat) and Robert Barnard were among those attending. Another leading writer of the time who came along with her husband was Kay Mitchell. Kay wrote several excellent books about Chief Inspector Morrissey, as well as a series under the name of Sarah Lacey. She was a modest and thoroughly likeable woman who seemed to be heading for stardom. But it’s nearly ten years since Kay published a crime novel. I’ve not seen her for a long time, and as far as I can tell, she’s dropped out of the crime writing world – her name isn’t even in the CWA membership directory. This is a real pity, because her books were very enjoyable. And it’s a reminder of a truth that many people don’t realise. It’s hard to get published in the first place – but it’s just as tough to stay published. Last night the Murder Squad visited Lingham’s bookshop in Heswall, Wirral. This is Margaret Murphy’s home patch and Cath Staincliffe and I joined her. Lingham’s – like Pritchard’s in Formby, which we visit tonight – is one of the best independent booksellers in the North West. It’s well documented that times are hard for bookshops – as they are for most retail outlets in the age of heavily discounted online selling. But both shops focus on personal service and quality and, in their distinctive ways, prove that a well-run, customer-friendly business can thrive even in tricky market conditions. What we lack in North West England is a bookshop specialising in crime fiction. I’m always impressed by the specialist shops that seem to thrive in the US – although they too, I guess, have to come up with plenty of fresh thinking to cope with the threat of the internet. Back in February, I appeared at the legendary Poisoned Pen Bookstore in Scottsdale, Arizona. Poisoned Pen Press are my US publishers and seeing the famous shop for the first time was a memorable experience. Made all the more so by my appearance at the store with the Stetson-wearing Sandi Ault and accompanying wolf (yes!) on my first night in town. Heswall was less dramatic. But fun all the same. I’m a member of a group of seven Northern crime writers known as Murder Squad. Margaret Murphy founded the Squad back in 2000 and we’ve been together ever since. It’s a gang of friends and a marvellous support group. We’ve done countless events together, produced a book of short stories and a CD, and even appeared together in a television programme. This week some of us are doing a short tour around the North West. This suits me, since it doesn’t mean I have take holidays from the day job – I can join up with the others for events in the evening. Last night’s gig was at Holywell Library in North Wales, with Cath Staincliffe. Cath is best known as the creator of the Blue Murder tv series, but her latest book Missing features her first series detective, Manchester private eye Sal Kilkenny. Do check it out if you like p.i. stories with a strong social/contemporary feel. It’s hard to believe that nearly a year has passed since Cath and I last did an event together. That time we combined talks and readings with a meal at a restaurant in Derby. Holywell was a more conventional event, but fun all the same. I know it’s a sweeping generalisation, but people who work in libraries tend to be among the nicest you could wish to meet. The Holywell staff had attracted a good turn-out of readers and their hospitality was all the more welcome after a long day in the office. Excellent escapism. I’ve received my copy of a chunky short story collection, The Mammoth Book of Dickensian Whodunits, edited by the amazingly prolific Mike Ashley. I contributed a story, ‘The Mystery of Canute Villa’, in which Dickens joins Elizabeth Gaskell in investigating a mystery in Knutsford, aka Cranford. I was born in Knutsford and thought it would be fun to set a story in the town. It’s a fascinating and historic place, well worth a visit, not only for the Gaskell associations, but also because of the weird and intriguing Italianate architecture of some of the buildings. As for the Dickensian Whodunits, there’s some great stuff in there from authors I admire, including Robert Barnard, Gillian Linscott and Kate Ellis. I’m looking forward to reading the rest of the stories. Oddly enough, this is the second Dickensian collection to include a story of mine. A few years ago, Anne Perry put together Death by Dickens. That time I teamed Dickens up with Wilkie Collins in ‘The House of the Red Candle’. This was a sort of locked room/impossible crime story which later made it into Maxim Jakubowski’s Best British Mysteries. One of the attractions of writing short stories to an editor’s theme is that you can quickly work out a framework. With a historical mystery, it’s then a matter of capturing the essence of the period, as well as of the characters. More about this another day. Here’s the story of my first taste of the world of television. The rights to my Liverpool books, featuring lawyer Harry Devlin, were bought by a delightful businesswoman whose close friend was one of the script-writers for Inspector Morse, Alma Cullen. How well I remember our meeting with Alma. It was in a phenomenally posh restaurant in Chelsea. Exquisite cuisine and the champagne flowed. Alma proved to be utterly charming. She came from Liverpool originally and she was in sympathy with the characters as well as the setting. It turned out that she had some terrific ideas for translating my first book, All the Lonely People, to the screen. For one reason or another, it never happened. Two years later, the option expired, and it was back to square one. This is a question people often ask me. Of course, it’s a polite way of saying they’ve never heard of me. A salutary reminder of my place in the food chain. I’m not famous and I’m not exactly a best-seller, which means I’m firmly in the ‘mid-list’ – a near-meaningless phrase used in the trade to describe most of the writers I know. Occasionally, someone rises from the mid-list to achieve wider recognition. Ian Rankin is a spectacular example. Others include two of my long-time favourite crime writers, Peter Robinson and Andrew Taylor. A lucky break helps. Winning an award, maybe, or finding a publisher who is really passionate about your work and is prepared to put real resource behind it. Andrew’s The American Boy was taken up by Richard and Judy. A television deal can transform your life – but only if the shows are actually made and keep reaching a wide and appreciative audience. We can all think of telly detectives who disappeared almost as soon as they arrived on the scene – a recent example was Gil Mayo, as portrayed by Alastair MacGowan. The shows were quirky and rather better than their critical mauling might suggest. But they were very different from Marjorie Eccles’ excellent books and maybe the changes were not for the better. At home, I keep a pile of scripts based on my books. Film scripts, tv scripts, a radio adaptation. All written by seasoned professionals - and they all have one thing in common. None of them have ever been made. Welcome to a brand new blog. The aim is to share my enthusiasm for crime fiction, and the craft of writing. From childhood, I dreamed of becoming a crime novelist - and I love being part of a fascinating world. I’m not only a writer, but a fan, and I’ll have lots to say about lots of terrific and often overlooked books and films, past and present. As for my own writing life, I’ll share the frustrations - and also the pleasures. If this blog encourages any would-be writers among you to keep at it, I’ll be delighted. I’ve just finished Waterloo Sunset, set in Liverpool and the eighth Harry Devlin novel. I’m hoping it will come out in the spring, and right now I await the verdict of my UK editor, Susie Dunlop….